PFD responded mutual aid with Athens Fire and Petersburg Rural to a single vehicle accident on Athens Blacktop Road. "Fire prevention is our intention"
The Petersburg Fire Department is committed to provide dependable service in a professional manner while showing compassion for those in need. We will protect lives, property, and the environment through fire suppression, emergency services, rescue, fire prevention, and public education. Our department is a part time fire department consisting of 19 dedicated members. Our members currently hold various State Fire Marshal certification including Firefighter 2, Firefighter 3, Basic Operations Firefighter, Advance Operations Firefighter, Fire Apparatus Engineer, Fire Service Vehicle Operator, Fire Service Instructor 1, Hazardous Material Awareness, Hazardous Material Operations, Technical Rescue Awareness, Vehicle Machinery Operations, Fire and Arson Investigation I, Fire and Arson Investigation II, Fire and Arson Investigation III and Emergency Medical Technician First Responder, Basic, and Paramedic. Even though our members are highly trained and certified we still depend on mutual aid from other county agencies and MABAS Division 48. Our fire investigation team members are affiliated with the International Association of Arson Investigators. Our department is a good standing member of MABAS Division 48 and the Springfield Area Mobile Intensive Care (SAMIC). Chief Rebbe, Deputy Chief Heubner and Captain Henderson were on hand to hand out candy to all the little trick or treater's in the parade. The weather was perfect and they had a great turnout. Thanks to everyone involved for the hard work of organizing such a fun event. PFD hosted the 3rd Annual Halloween Costume Party at Roots on October 20th. Thanks to everyone who attended the party, there were lots of great costumes this year. Thanks to the Boars Nest in Athens for their particiaption. PFD would like to welcome Colton Doerr to the department. Colton comes to our department as a previous member of Kilbourne Fire Department. Colton works for Brandts Cons. in Williamsville and lives in Petersburg with his wife and children. The members of PFD would like to welcome our newest member, Nick Hummell. Nick is a lifelong resident of Menard County and resides in Petersburg with his wife Rhonda Hummell and their two children, Tenley & Mason. PLEASE HELP US TO HELP YOU!!!!!! By now you have probably seen the reflective 911 home address signs on many of your neighbor's mailbox posts. Made of the same tough materials as road signs these home address signs are so reflective in the dark that members of the Petersburg Fire Department don't have to struggle to read your address at night. If you are interested please contact 911 coordinator John Balster at 217-632-5460 to purchase these signs. 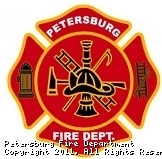 The Petersburg Fire Department is currently accepting applications to join the department. If you are interested and would like to get more information on the department. Please contact our membership officer Chief Pat Rebbe at patrickrebbe@petersburgilfire.org. We normally add members in pairs but we will accept applications at any time. How many smoke alarms are in your residence? This site has been viewed 95,580 times.